Guar is Cluster beans, also called as guar phali in Hindi. The beans are a developed taste for many but those who like this vegetable, just love it. A lot depends on how you choose the beans when buying as guar can get really hard and fibrous when you pick up mature or stale beans from the market. Look out for slender beans that are tender to touch and shiny in appearance. Guar phali can cooked in many ways, you can stir fry them with chilly garlic paste to make lasuni bhujia or cook them with eggplants with loads of garlic and some hing. 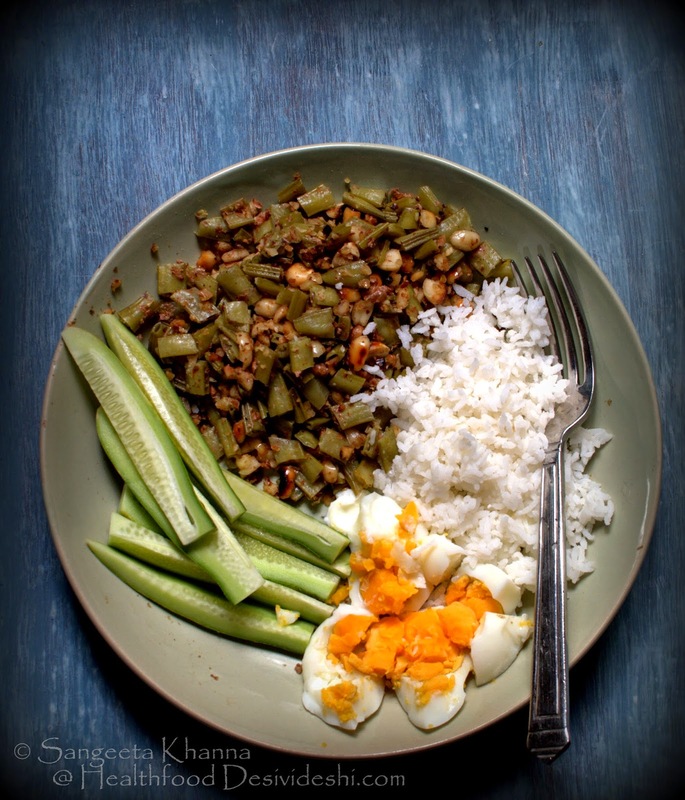 A dry curry of guar beans made using a sesame powder is one of our favourite too. Guar dhokli I discovered later and became a favourite too. Now you know how much I love cluster beans. You can imagine how happy I was to find a quicker way to cook this vegetable and that too when the husband reported that he liked the subzi in his lunch box. This is a sookhi subzi that borders on the territory of a 'stir fry salad', I found it one day on Anita's facebook timeline when she was cooking it and posted a picture. I was so curious I cooked (actually tossed) this curry the very next day and loved it. She later posted this recipe on her blog as well. I have cooked this one a few times since then, once I added a little shallow fried dry shrimp too, like in this long beans recipe with sambal belacan. But I realised I liked it with peanuts and garlic only, with varying degrees of chilly heat depending on my mood and the summer heat we are living in. 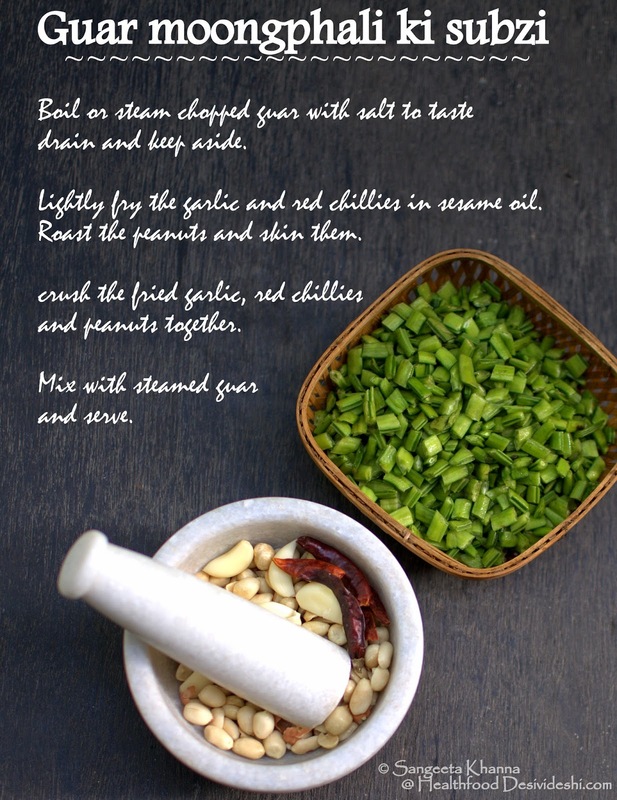 Oh yes, and the recipe involved boiling the chopped guar and mixing it with a coarse powder/paste of the roasted peanuts, garlic and red chillies. Just that. Add the salt to a cup of water and bring to boil. Dunk the chopped guar in the boiling water and wait till they change colour, it takes about 4-5 minutes for tender guar. Keep the lid on while cooking. Drain and keep aside. Lightly fry the garlic and chilly in hot oil. Take them out and pound them along with roasted peanuts in a mortar and pestle or in mixie jar, make sure the paste is really coarse. Mix the paste with boiled guar and serve as desired. We loved it mixed with plain boiled rice. Peanuts were a bit generous in my recipe so I decided that this will be our simplified balanced meal. When the peanuts are lesser, I like to add a boiled egg to my plate. 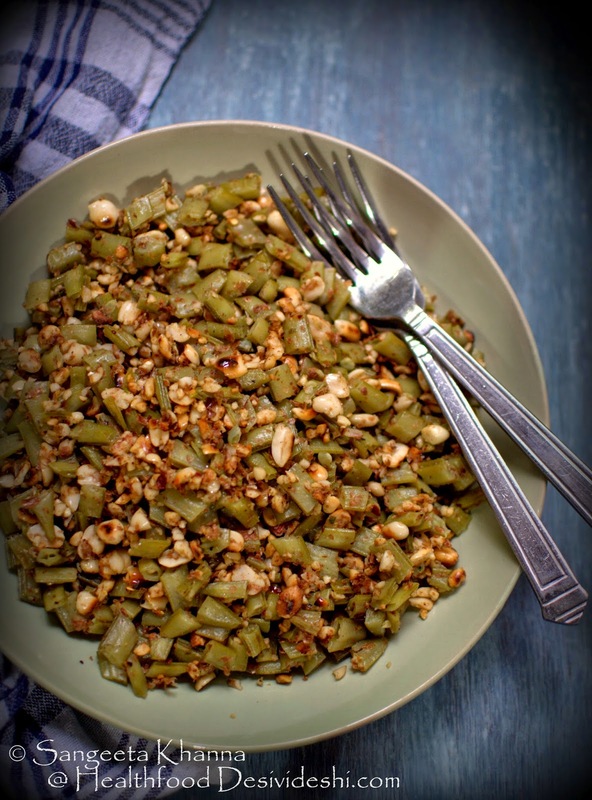 Try this recipe at least once even if you don't like guar. I am sure it will convert you for life. Guar mugphali ki subzi is here to stay in my kitchen for sure. Some recipes are too simple to be that good; this one is! Glad you and A like it. Great receipe. Will try it soon. Let's see how it goes with my husband for he is not a guar lover. I have mentioned it Nandita. See the 2nd line of procedure - Lightly fry the garlic and chilly in hot oil. Take them out and pound them along with roasted peanuts in a mortar and pestle or in mixie jar, make sure the paste is really coarse. Thank you for commenting here. Always good to see some communication here. Thanks Sangeeta, don't know how I overlooked it! Made it the other day and turned out great.